Tawney B teamed up with Balloons With a Twist to create a floral themed balloon dress for Art In Full Bloom. Art In Full Bloom is an art and floral design event to bennifit Aid for AIDS Of Nevada (AFAN). This year’s theme was “Crazy Dasiy.” Artist we’re invited to create a unique piece of floral themed art. The pieces were then actioned off throughout the night, and all proceeds went to AFAN. We were blown away by all of the gorgeous floral displays and elaborate pieces. 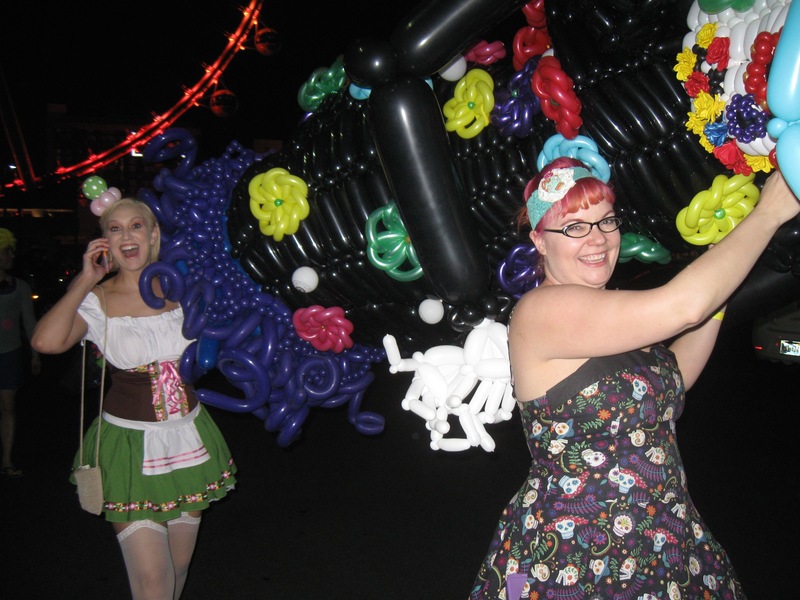 The dress itself was covered in balloon flowers and boasted a massive balloon headdress. It used a combination of neon and metallic colors to keep with the theme. All night our model posed for pictures and chatted with the guests. Since atendees were invited to wear bright flamboyant colors and costumes, the whole place was full of color. The balloon dress fit right in! If you’ve been following us, you know World Inflated and Balloons With a Twist often work together for this charity. AFAN, short for Aid for AIDS of Nevada, is a wonderful organization focused on providing relief and help for Nevada residence living with AIDS or HIV. Attendees were encouraged to make a donation to the charity, or purchase one of the many pieces of art on display. Our model for this event was none other than physical Dr. Chris. She brought so much energy to the outfit! This amazing woman took time out of her VERY busy schedule to don a Balloon dress and chat it up with attendees. Her vibrant personality brought an extra beauty to the design, and we are so honored she wore it. Mayesh is a great big giant flower shop (understatement) with a fantastic event space. They generously opened their doors to the Las Vegas community, and we couldn’t be more greatful! Their stunning warehouse was perfect for the party. There was plenty of room for the crowd, and they did a great job decorating the place with an amazing floral display. We had such an great time walking around the space, and taking in all of the wonderful smells. Thanks so much to everyone who made this event happen!